How are the bonuses and equity incentives of CEOs decided? In a time when fiscal responsibility and corporate governance are at the forefront of our consciousness, this is an area that needs investigation – a niche that fourth year PhD student Hrishikesh Desai is filling with his research. In 2016, Justin Lahart wrote a sensational piece in the Wall Street Journal about the proliferation of ‘adjusted’ accounting performance measures in CEO incentive compensation plans. These adjusted measures, which do not follow ‘Generally Accepted Accounting Principles’ (GAAP), were mainly used and disclosed by companies in their periodic earnings press releases. Companies are allowed to use and disclose these measures as long as they do so appropriately. Prior empirical research has failed to scientifically explore the use of these measures in setting CEO bonuses. Recently, there has been a lot of regulatory heat on the use of these measures in general. The most salient case in recent times is that of Tesla Motors, in which the company was censured by the United States Securities and Exchange Commission (SEC) for using an “adjusted revenue” measure in its earnings press release to investors. 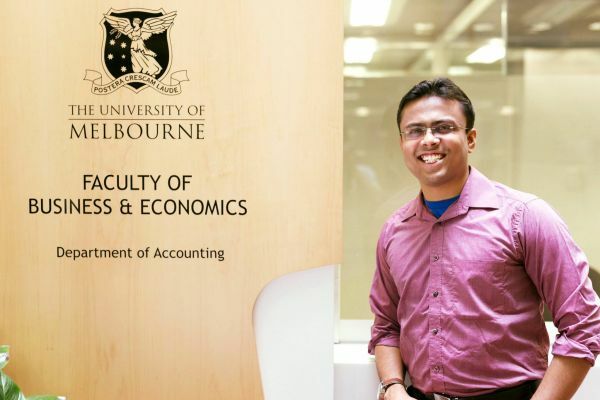 I am a fourth year PhD student in the Department of Accounting at the University of Melbourne, and my research looks at the use of these adjusted accounting performance measures in CEO incentive compensation plans. Specifically, I am seeking to answer the question as to whether these adjusted measures are used opportunistically by powerful CEOs who have influence over their companies’ board compensation committees to earn bigger paychecks, or whether these measures are, in fact, more useful to investors to gauge companies’ performance. Some prior research has found these adjusted measures to be more informative than their comparable GAAP counterparts, because of the fact that they exclude any “non-recurring” items. For example, if a company wants to exclude a one-time loss or expense in calculating its operating profit, it makes sense for the company management to do so as investors are interested mainly in predicting the future profitability of the company and one-time or unusual items arising in a particular year are not relevant to them for the purpose of valuation. The archival component of my thesis is, thus, trying to examine and contrast the informativeness versus the opportunistic motivations behind the use of adjusted accounting measures in setting CEO bonuses. Undertaking a Research Degree at the Faculty of Business and Economics means you’re uniquely placed to explore new lines of enquiry, improve people’s lives, and contribute to a better understanding of our world. Tackle the challenges of the 21st century head on, by exploring one of our three strategic research priorities – health and wellbeing, decision-making and markets, and corporate governance. Find out more about Research at the Faculty of Business and Economics here. I am also experimentally trying to determine as to how the use of adjusted accounting measures affects investor judgement and decision-making. This involves an in-depth study of the cognitive psychological processes that are set in motion when investors are presented with an adjusted measure versus a GAAP measure and asked to make an investment decision in a company. The nature of my research requires access to some costly and proprietary data sources and the Faculty of Business and Economics has been quite supportive in providing funding towards the same. We also have visiting professors in our Department from some of the top schools in the world – Harvard, Chicago, Stanford, and Duke to name a few. They have not only provided valuable inputs in my research but they also teach in our PhD program. The insights that I have gained from attending their classes are invaluable. The quality of research that we do here is of the highest standard and is aimed at top journals in the field. We are provided rigorous training in econometric techniques to carry out our research efficiently and also understand and critique extant literature. The Department also encourages us to tutor accounting subjects of our interest, which enables us to gain requisite teaching experience that sets us up for a career in academia. My time at the University of Melbourne has been nothing short of sublime and overwhelming at the same time.